What is a Diamond Grading Certification? When purchasing diamonds, certified diamonds are the correct way to go. What are certified diamonds? They are loose diamonds that have been analyzed and documented by preferably the Gemological Institute of America (GIA). These documents, or certificates show an individual diamond’s specific statistics such as carat weight, color, and clarity. Much finer details such as depth percentage, table percentage, polish, symmetry, millimeter measurements and fluorescence are shown as well. Certified diamonds also show the location and type of inclusions a diamond may have, and how that affects the clarity of the diamonds. Not all diamonds come with a certification. Olschwanger Designs believes they should. When you have your consultation, not only will we insist that your diamond is certified, we will also insist that it is G.I.A. certified. G.I.A. 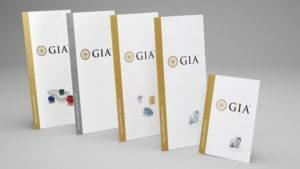 (Gemological Institute of America) is not only an opinion on the grade of the diamond, but G.I.A. is THE most respected and strictest Gem Grading Laboratory on the planet. There are many other laboratories out there certifying diamonds and other precious stones, but some of those labs are very lenient in their grading of gems while using G.I.A. terminology and language. When you spend money on a valuable gemstone, you should want the stone graded accurately. You as a buyer need to know that your jeweler is “in your corner”, and by having a G.I.A. certified diamond, you can feel good about what you have purchased. Certified diamonds from a reputable laboratory not only provide detailed information on a specific stone but will also give its buyer piece of mind that they are purchasing exactly what they are told they are purchasing from their jeweler. It is also very important that the buyer receives the original certification report on any diamond they purchase. Olschwanger Designs deals exclusively with certified diamonds by G.I.A. Our customers know every detail regarding the quality of the diamonds they purchase from us. Call to set up an appointment to discuss the advantages of purchasing diamonds from Olschwanger Designs. You can also fill out a form to email us directly.